Season : December through April only! Join us on our Great Hammerhead Safari! Daily space is limited to 12 lucky guests who will experience these elusive giants up close! Our Great Hammerhead Safaris run for a limited-time period each year, and have limited-availability, so book now to secure your place on one of the most spectacular dive opportunities available anywhere in the world! Tanks and weights as well as mask, fins and snorkel. Bimini has emerged as one of the best places on the planet to encounter one of the ocean’s most amazing predators, the Great Hammerhead Shark. These elusive giants have evaded divers for years, but now Neal Watson’s Bimini Scuba Center has access! We were the first and only operator on Bimini to offer this amazing excursion and have learned the secrets of this spectacular experience from the original people who discovered this dive years ago. We are committed to safety, both for our divers and the sharks and are excited to unveil this thrill of a lifetime to our guests! Our Great Hammerhead Safaris run for a limited-time period each year, and have limited-availability, so book now to secure your place on one of the most spectacular dive opportunities available anywhere in the world! Available during the months of December through April only! Daily space is limited to 12 lucky guests who will experience these elusive giants up close! Exact departure and arrival times will be chosen by the captain and are dependent on weather and tides. The average Great Hammerhead Safari runs from 11am to 5pm and usually includes a two-tank dive. Welcome to Hammer Headquarters! Guests should arrive at least 15 minutes before the scheduled departure time. Drinking water will be provided on board, but we strongly recommend bringing along snacks and/or lunch. After anchoring up at Hammer Headquarters, we will begin to set-up for the dive, this includes baiting the water. Once set-up is complete, it’s time to start looking for sharks! This process can take anywhere from 5 minutes to several hours. 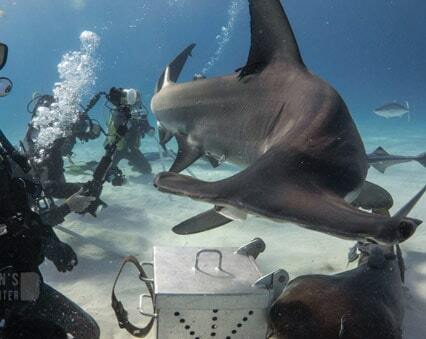 Once we attract a Great Hammerhead and they are comfortable, divers will be invited to enter the water. The dive is in approximately 20 feet of water so our tanks will last a long time! Once you’re out of air and because the bottom time is so long, we suggest going up, getting some food and resting before going down again. However, you’re always welcome to dive, dive, dive! Keep in mind, average water temperature during Hammerhead season is around mid to low 70s, thus we always recommend a full 5mm wetsuit, hood and gloves. We always dive until we’re either out of bait, tanks and/or sunlight — whichever happens first! We highly recommend purchasing DAN Trip Cancellation Insurance for all Neal Watson’s Bimini Scuba Center’s activities and dive packages offered. This insurance is backed by DAN & Travel Guard and pays in the event of your trip being cancelled or delayed due to weather, airlines and a host of other reasons.